I am proud and grateful to introduce the Denninghoffs Company to you. Being in the national and international beer business myself for almost twenty years, my aim is not only to sell and export our famous beers, brewed strictly according to the German Purity Law, but also to bring a part of German culture and German tradition to all our customers worldwide. The history of our breweries and their skill and art of brewing dates back to 1899 and 1613 respectively. Grown out of that heritage we supply a variety of beers of the highest quality. By using only the best ingredients, our Denninghoffs and Haubach beers are brewed sustainably, traditionally and with the highest standard possible. Beyond that, the Denninghoffs Company provides also exclusive brands and private labels tailor-made for your demand and your sales strategies. You can choose a top quality brand from our wide range or you can get a label especially and individually designed for you. Our experience and advice will always be available to you. Put your faith in us as a reliable and stable partner for your successful business in the future. Denninghoffs started with the export department in 1968 and have been evolving ever since. Growing from a classic brewery into an independent supplier of German beers brewed in accordance to the Bavarian purity law from 1516. We supply the world with our own brands and beers or private labels. Our target is to be one of the most flexible supplier in the beer business. Our competence to create a private label is a vital part of that goal. We are able to supply all German beer styles. Our main brand Denninghoffs is always ready for you. We are proud to be one of the most flexible partner in business. Beginning with order size and flexibility of mixed orders in one box. Our products leave Germany in best quality and we make sure that they arrive in the same excellent condition at their destination. Our CEO Thomas Kühn is member of the official delegation of the state of Baden-Württembergs ministry of economy, which is travelling to Brazil for 8 days. There will be talks with members of the Brazilian economy in the cities of Joinville/SC, Curitiba/PR and Sao Paolo/SP. Our brewing roots go back nearly over 400 years to the year 1613. 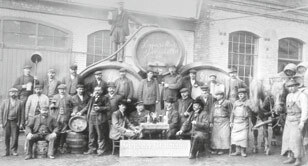 As the founder of Kronenbrauerei Haubach in the family Wängler exercised the brewing and baking industry. First for its own needs then later in the 19th century to be produced industrially. The oldest previously line of ancestors Haubach is originally from the area of Frankenstein in Silesia Family Wängler . They were able to be detected until the end of the 15th century, where they were well-off compatriots. In 1566 emigrated David Wängler, who called himself Pareus, reformed faith due to Heidelberg , today’s corporate headquarters. Pareus was a very famous professor of theology and rector of the old German university in Heidelberg. There is documentary evidence that in 1613 , before nearly 400 years Lukas Wängler learned bakers and brewers craft and by his marrying in Family Krehe the even older bakers and brewers tradition continiued led. At the end of the 19th century, nearly every place of a certain size in Germany had its own brewery. Realising the sales potential of beer in the Giessen area, entrepreneur Adolf Denninghoff decided to build a modern brewery between the Marktplatz and the Marburger Straße in 1899. When the Giessen Brewhouse was planning to relocate from the town centre to the edge of the town in the seventies, traces of a Roman fort were discovered on the new site in Wieseck. The new building that evolved from 1976 to 1978 housed Hessen’s most modern brewery. From the laboratory to the production line, the company was able to install, without compromise, the best brewing and plant technology. Until the nineties, beer lovers tended to stick with one brand. And even then, you were either a Pils or an Export drinker. For a few weeks in winter you were able to get heavy Doppelbock – and that was enough for beer drinkers. But times have changed. Today’s beer drinkers are open to new trends, they are curious to see what else the art of brewing is able to come up with. Heavy or light, top- or bottom-fermented, with or without alcohol, with Coke, lemonade or even whisky. Bavarians are drinking Kölsch (a very pale ale from Cologne), Hessians are drinking wheat beer – the world of beer has become more rich and varied.